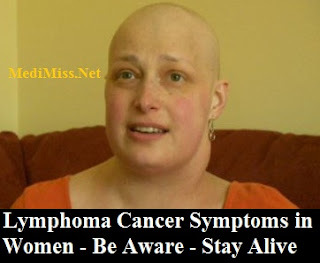 Lymphoma symptoms and especially lymphoma cancer symptoms in women are easy to be missed. It is so, because they can be taken for standard discomfort, to which we women are so familiar with by the default of being female. Lymphoma is a form of cancer of the lymphocytes, a type of white blood cell. Because our knowledge about this disease is so limited, it comes to be even more dangerous. Let me share with you what my friend told me about her condition. "At first, I started losing weight. I was so glad to see it happen; we all know how hard it is to lose weight in our age (after 50). The next - somewhat unusual for me condition - was heavy sweating, especially at night. I didn't think twice about this though, it was winter time, I was probably too hot in general from the combination of keeping the house warm and using a heavy comforter, so I thought. You know, we always find an answer if and when we want to. Another day I noticed, my skin was itching; I had an explanation here as well; it must have been something wrong with the soap. Another incident of lymphoma symptoms I did not recognize, another unpremeditated excuse minimizing the seriousness of the situation. It was not until I noticed blood while coughing, when I decided to see my doctor". Why this story? To help you recognize the limited knowledge about the lymphoma symptoms leading to a very late diagnosis, diagnosis at a very advanced stage of cancer. Should the lymphoma cancer symptoms have been diagnosed early, the condition could be put in regression, if not totally cured. It is not the ignorance though. The difficulty in recognizing lymphoma cancer symptoms is coming from the fact that the same symptoms are very "common" to other, not necessarily serious conditions. Let's concentrate on lymphoma symptoms in women. What are they? First and most common of all are the swollen lymph nodes, caused by the lymphoma cancer cells. This can be noticed mainly in the armpits, neck and groin. The nodes are quickly noticeable because of their location near to the skin surface and not so due to pain. The next symptom is a rapid and unintentional loss of weight. Fever and night sweats, fatigue as well as problems with breathing continue the list. Since these symptoms very closely resemble infection symptoms, a lot of patients are being incorrectly treated for such instead of the true cause - lymphoma. Mentioned here are only the few lymphoma symptoms in women. There are at least fifteen of them, which women can easily neglect, because we are so used to different kinds of discomforts being women. The list continues with abdominal pain, headaches, weakness and swelling of arms and legs, bowel obstruction, shortness of breath, coughing. In conclusion, our strong recommendation is to see an oncologist if such symptoms stay unchanged (hopefully not getting any worse) for two - three weeks. It is in the patient's best interest to check it out. With a series of tests the presence or absence of lymphoma can be easily diagnosed; the sooner the diagnosis, the better chances of survival. And - if there is nothing wrong, the peace of mind gained after such visit is just priceless. Be am amazed with the value of experience that comes from a simple heart to heart conversation. Yes, when the words are missing, hearts talk. Breathe in the magnificence of life and breathe out the passion for love so others can be poisoned with it. Cell Phones and Brain Cancer: Is There a Link?